One surprising outcome from the November 2018 mid-term elections was voter approval of ballot initiatives expanding Medicaid coverage in Idaho, Nebraska, and Utah. These victories were preceded by a similarly successful ballot initiative in Maine in November 2017. In three of the four states (not including Nebraska), Republican leaders have attempted to thwart the will of voters by undermining or negating the initiative wins. In the process, the issue of Medicaid expansion as permitted under the Affordable Care Act (ACA) has become reinvigorated. Unknown by most is that a relatively new and ambitious national organization called The Fairness Project was key to these significant health access victories in all four states. The Fairness Project’s background story is compelling, as are on-the-ground stories of the roles it played in each state. The Fairness Project also bears watching because as many as 14 state governments still are unwilling to expand Medicaid as authorized by the ACA in the next two years. Six of those states allow citizens to advance policy initiatives to the ballot, including Florida and Missouri. Planning for 2020 is already well underway. The inspiration for The Fairness Project came in 2014 from Dave Regan, president of the labor union Service Employees International Union-United Healthcare Workers West (SEIU-UHW). Regan wrote a widely distributed letter suggesting that organized labor was squandering power and influence by focusing heavily on collective bargaining while ignoring the economic needs of tens of millions of unorganized lower-income workers. As a Californian, he had seen firsthand how citizen ballot initiatives can achieve wins outside of traditional paths to power. The Fairness Project launched in 2015 with support from the SEIU-UHW. Between 2016 and 2018, The Fairness Project played a key role in winning ballot initiatives to mandate minimum wage increases in Arizona, Arkansas, Colorado, Maine, Missouri, and Washington State. In California, the District of Columbia, and Massachusetts, The Fairness Project ballot initiative efforts triggered legislatively mandated minimum wage increases without going to the voters. In the same period, The Fairness Project won ballot initiatives to mandate paid sick leave in Arizona, Michigan, Washington State, and San Antonio, Texas, and to cap payday loan interest rates in Colorado. The Fairness Project’s executive director is Jonathan Schleifer, former chief policy officer for Iraq and Afghanistan Veterans of America and former executive director of Educators for Excellence in New York. Since 2016, his seven-person team has learned many lessons about winning ballot initiatives. The Fairness Project works with local activists and groups to build professional campaign websites, exploit social media, raise local and national funding, hire staff, ensure that polling is rigorous and honest, and ride “shotgun” with state-based partners for the campaign’s duration. As of 2018, its track record is an impressive 16 wins and 1 loss; its minimum wage increases have put an estimated $7 billion into low-income workers’ pockets. Maria Weeg, who served as general consultant to Idaho’s campaign, saw The Fairness Project as a helpful bridge between the long-time and legislatively focused “Close the Gap Coalition” and the newer “Reclaim Idaho” grassroots movement. “The Fairness Project provided another voice in the room, much-needed resources, cutting-edge data, and facilitation to bring the two groups together.” In the end, the campaign raised $1.77 million, half from instate sources and half from The Fairness Project’s national donor base. Two weeks before Election Day, the campaign secured a public endorsement from outgoing Republican Governor Butch Otter, who had opposed Medicaid expansion up to then. The Fairness Project’s effectiveness continued in all three states after the November wins, helping state groups to organize to defend their victories. 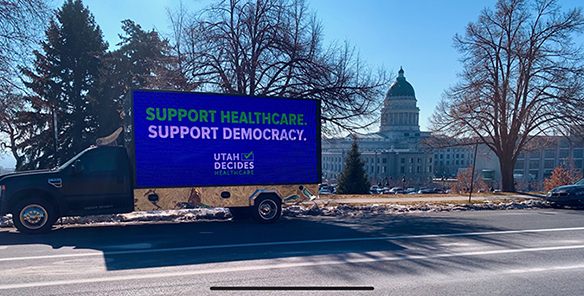 In Utah, the state Senate had passed a watered-down version that requires a federal Medicaid waiver and specified that if federal approval were not provided, no expansion would happen, negating the entire voter initiative. Local groups descended on the state House of Representatives and won a vital change—signed by Governor Gary Herbert (R)—that if a federal waiver is not approved, the original initiative will be implemented as written. Unsurprisingly, financing is a challenge. In Montana, the $2 tobacco tax proposal drew $18 million in opposition spending from that industry. The inclusion of sales tax funding in Utah’s plan reduced their expected margin of victory. On the other hand, lack of financing in the 2017 Maine initiative gave then-Governor Paul LePage (R) the argument to stall implementation until his departure 14 months later. Given these experiences, articulating a generalized financing theory is challenging. It will be case by case for the time being. Going forward, The Fairness Project will continue its minimum wage, paid sick leave, and other campaigns to help disadvantaged workers. It also intends to keep working on state Medicaid expansions. Only six of the remaining 14 non-Medicaid expansion states allow citizen ballot initiatives: Florida, Mississippi, Missouri, Oklahoma, South Dakota, and Wyoming. The jewel of these is Florida with as many as 1.25 million potential Medicaid enrollees, including many recent exiles from Puerto Rico. However, the only feasible pathway to voter-driven expansion in Florida requires a constitutional amendment that carries a high voter signature threshold and a required 60 percent voter approval margin; the Sunshine State also has one of the nation’s more expensive media markets. Moreover, lawmakers in Florida and Missouri as well are even now contemplating how to make the ballot requirements even more onerous. More than a few savvy health policy leaders demurred in supporting The Fairness Project’s Medicaid campaigns in 2017 and 2018. The Project’s leaders, undeterred, saw opportunity where others only saw risks and downsides. As Marcel Proust wrote: “The real voyage of discovery consists not in seeking new landscapes, but in having new eyes.” Schleifer and colleagues’ new eyes have helped to transform the nation’s political landscape regarding Medicaid. Here’s hoping that they keep looking.